Have you ever been involved in provided extended care for a family member or relative? Have you thought about what would happen if you needed care for several months or for many years? The associated costs can threaten a lifetime of savings. Caregiving can place a significant emotional and physical burden on spouses and family members that many would like to avoid. 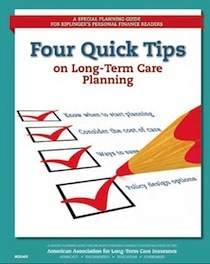 This latest guide from the American Association for Long-Term Care Insurance will help you make better decisions when considering your LTC planning needs and options.